This series of articles found in an old Campbellton newspaper tells a story of the town as it was in 1898 and prior to that date. I have copied most of the paper's articles and will place them here one at a time. Should any of you know of such old papers in someone's attic or old picture box please make sure to have them contact me so that these old history clips can be collected and shared with everyone who's interested. Some parts of this paper are illegible as it is 110 years old and is held together in many places by scotchtape (the worse thing to put on old documents by the way) the tape yellows and makes the reading very difficult. The growth and prosperity of a town may be accurately gauged by its business, and we have only to briefly refer to some of the prominent businesses establishments of Campbellton to give a fair index to the rapid growth of the town. There are now in ton over one hundred business establishments, more than twice as many as there were at the time of incorporation, ten years ago. And not only have the business places increased in number, but the volume of trade has also largely grown in that time. Among our foremost business firms we may mention. In no line has there been so great a growth during the past few years as in printing. 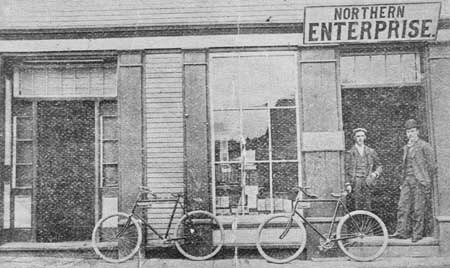 A little over five years ago the Northern Enterprise made its first appearances, and while receiving the cordial support of the town from the start, the first year or two the trade in job printing and advertising was very limited, compared with the extent of which it has now grown. The Enterprise is now well known all over the Maritime Provinces, and has a large circulation throughout Gaspe, Bonaventure and Gloucester counties, as well as in the county of Restigouche. The plant has been greatly improved during the past few years, and is now equipped to turn out work equal to any outside the large city offices, and business and office stationery unexcelled anywhere. The office employs seven compositors and apprentices. During the past few weeks the editor has managed a new department in the publication ?? meetings may be found in brief. Owing to the interest centering in the news ?? the seat of war this little sheet ?? attained popularity and may become a permanent publication if the ?? accepted it from its inception is continued.